As a Mom, I often find it hard to indulge myself in nicer things because I feel like it might take something away from my children. The one indulgence that I give into frequently is essential oils and essential oil jewelry. The reason that I allow myself to give into each of those is because I feel like it make me a BETTER MOM! Essential oils are a vital part of my day and I use them to improve my mood or make me more alert and focused throughout the day. I use them for other things as well, but when I am wearing my essential oil jewelry, it is primarily for mood and focus! 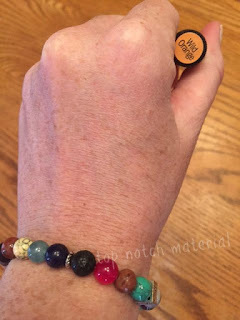 I am so in love with my bracelet from Lahvala and I also love the wide selection of essential oil necklaces, kids jewelry and even essential oil blends that are available from this site! I love that the bracelet I received came with a sample of wild orange essential oil as well. All are priced reasonably and make great Christmas or Birthday presents for the essential oil lover in your life! Win It: LavHa sent me an extra bracelet to offer as a giveaway to one of my lucky readers. I like the Clear Thinking & Mental Grounding bracelet. I also love the Yin-Yang bracelet. It has a lot of personal meeaning for me, and besides that, it's so pretty! I really love the alignment-silver-bangle. It takes me back to the times when I wore dangling things. I love the Yin-Yang bracelet, too. It matches a necklace I have. Art of Zen Necklace is so pretty love this necklace. I checked out the website and I really like the love-of-life bracelet. I like the Divine feminine bracelet.